Half of you (50%) indicated you have 3 or 4 true friends, which to be sounds about right. Fortunately, none of you thought they had no true friends. Also, I appreciate the private comments I received regarding my weightlifting friends mentioned in last week’s post. Since yesterday was Easter, I thought this week’s theme should be one of optimism. I hope all of you had a wonderful Easter and got to share the day with family or friends. 9. Who ever heard of bringing Easter Oatmeal? 8. More likely to be well received since eggs come in many varieties: scrambled, over easy, hard boiled. 7. Local chickens give him a good deal on eggs. 6. Has stock in companies manufacturing cholesterol lowering statin medications. 5. Pressure from the Egg marketing firms. 4. Because if he brought fireworks, he would be the Independence Day Bunny. 3. Would you want to hunt for oatmeal? 2. Attempt to help guys get chicks at least once a year. 1. Because the Energizer rabbit got the better job. One of the earmarks of many ordinary people is negativity. And not only do they believe that their dreams will not come true, they will be delighted to explain why your dreams will also not come true. Extraordinary people are optimistic about their dreams as well as your dreams. When the extraordinary person experiences a setback, they reassess their goals and if they still believe the goal is worthy, they continue their efforts looking for more effective ways to accomplish their goals. If you are feeling down on your luck, and who hasn’t, perhaps you may want to check out Joan Rivers book, Bouncing Back. I first read this book back in 1998 and I continued to review it over the years and found it to be helpful. I do have to admit that I haven’t looked at it since I left the corporate world at the end of 2009, but keep it handy just in case. For those of you that have read my book, it is easy to see that I like treating heavy topics with a light touch. 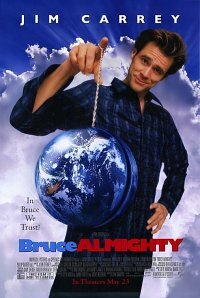 And so to find a film related to both Easter and to Optimism, I selected Bruce Almighty as a film that uses a light touch to illustrates some heavy issues. If Thomas Edison didn’t actually say this, he should have. “I have not failed 1,000 times. If you like what I am doing, I need you to show your support by passing this blog on your friends, and liking my Facebook page Harmony Books & Films, LLC. Currently, 33 of you have been kind enough to like my Facebook page. Also, a number of you have “liked” my posts and I appreciate very much. Perhaps, you may also consider liking my Facebook page. A big thank you to my friend Betty, who this week gave my book a review on Amazon, in addition to the one Judith left sometime earlier. Hi, Bill–Thanks for the tip on where to find your “leave a comment” area. I hadn’t noticed it before. Regarding your Easter blog…I almost always feel very optimistic (inside), or at least I try to show my enthusiasm for most any subject. I must confess, however, that the instability of our world has me shaken lately, and has severely challenged my normally optimistic view of the future prospects for our world. But then I remind myself that every generation (likely since the dawn of man) has had to deal with serious threats of one kind or another, and so far we’ve all “made it” to this point, at least! I love Easter, as it is then that we are directed with so much reassurance, and most happily to all the new beginnings of Springtime. I’ve been looking through the garden for baby bunnies, but haven’t discovered any as of yet this season. I know they have to be out there, so I’ll keep searching. The robins have been gathering items from our garden to help build their nests, which I find most encouraging. Finally, IT REALLY IS SPRINGTIME! We’re enjoying this lovely new beginning and hope you are as well! Mary Ellen, thank you for leaving a comment. If you can’t find any baby bunnies in your yard, please stop by my yard; where the bunnies are easy to spot. We always enjoy your Easter rabbits!